Kerry James Marshall, Untitled (London Bridge) (2017). After spending much of the opening day haunting the aisles of the first floor of Art Basel—the fair’s prime real estate, reserved for the more senior and established galleries hawking eight-figure Basquiats and the like—I took the afternoon to explore the upstairs, where the next tier of outfits set up shop alongside the two special sectors, Feature and Statements. There is a lot to see! Jordan Wolfson’s Untitled house at Sadie Coles HQ. “It’s sort of his first static sculpture,” Coles said, standing in the booth. 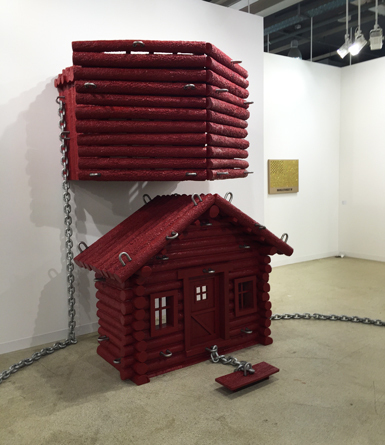 Indeed, it seems like a bit of a departure, until you notice the chains that lie around the work in a half circle, recalling the chains that held the character that got thrashed around in Colored Sculpture (2016) at David Zwirner in 2016. It’s all part of the same myth, apparently—“it’s supposed to be Huck Finn’s cabin,” Coles explained. Christian Jankowski’s map to Harry Bar, presented as a tapestry. Moving on, there’s one of Christian Jankowski’s delightful map tapestries at joségarcía that would be helpful for anyone about to head to Venice during this summer’s Grand Tour: it shows you how to to get to Harry’s Bar. 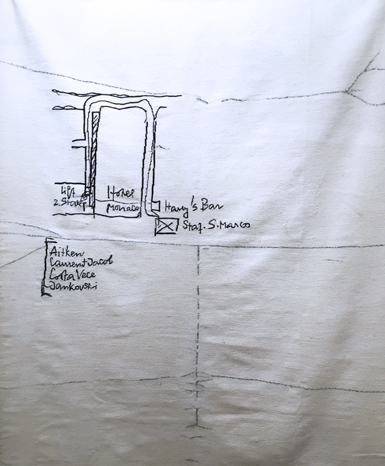 The map is taken from a route scrawled on a napkin by Jankowski’s assistant during the Biennale in 1999 when the artist had to go meet Swiss curatorial giant Harald Szeemann at Harry’s but didn’t know how to get there. Chantal Crousel has a delightful little Danh Vo birdcage in an edition of 150 that’s selling for €2,800 (and is also available at Marian Goodman Gallery downstairs). Much bigger is the floor-to-ceiling Jonas Wood at David Kordansky that sold for $450,000. Another big guy is the hulking white marble Adrián Villar Rojas at kurimanzutto, a pair of big legs and two kittens smooching. The cover art for the new Lorde album, painted by Sam McKinniss. Over at Team Gallery, if you swing around the front wall you’ll see a free hang of paintings by Sam McKinniss, with portraits of a dog, Michael Jackson, and, best of all, the rapper Cam’ron. This is probably Killa Cam’s only appearance at Art Basel. 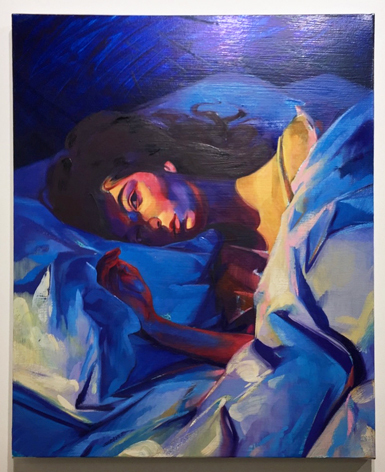 There’s also the McKinniss painting commissioned by the pop star Lorde to be the cover of her new album, Melodrama. It’s already an iconic image among Lorde fans—some have even gotten the painting as a tattoo, apparently, which is pretty bizarre. 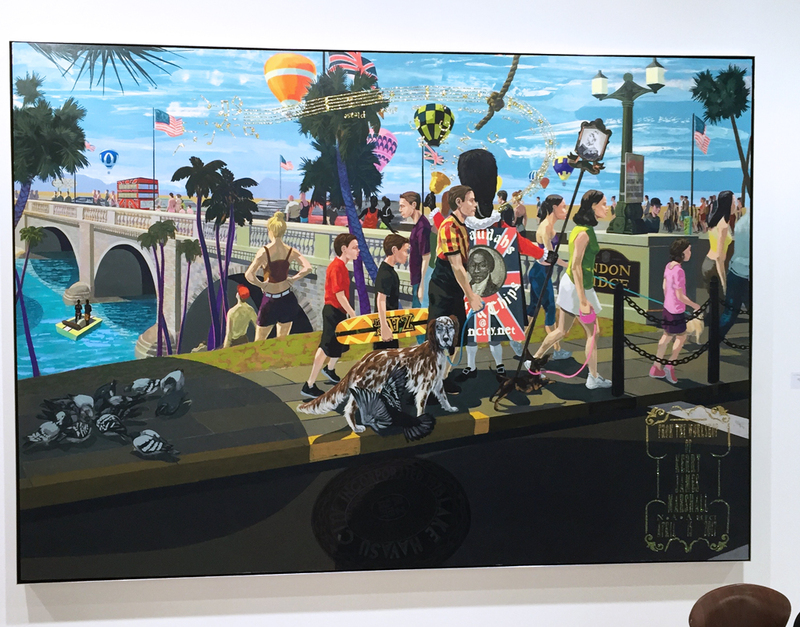 And then around the corner is a grand and brand-new Kerry James Marshall at Jack Shainman depicting a glorious sunny day on London Bridge—that would be London Bridge in Lake Havasu, Arizona, not the one in London, England—with music in the air and hot air balloons dotting the sky. It was priced at $2.5 million and went to an institution.